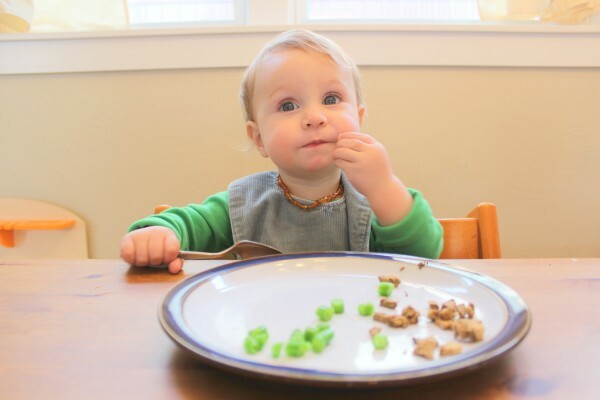 Starting babies on solids is something all mothers think about, some wonder when the soonest they can introduce a baby to solids is, others want to put it off as long as possible. Every family needs to choose a method that works for them; it’s my belief that not only are all babies different, but all families are different as well. Here’s what we did, as well as what Sally Fallon of Nourishing Traditions advises and Dr Natasha Campbell McBride of Gut and Psychology Syndrome. I was super relaxed about feeding solids to my kids. With my two older children, I waited until they met the ‘baby led weaning’ (could sit up unassisted, were at least 6 months old, had at least one tooth) and then offered some whole single-ingredient foods to them. 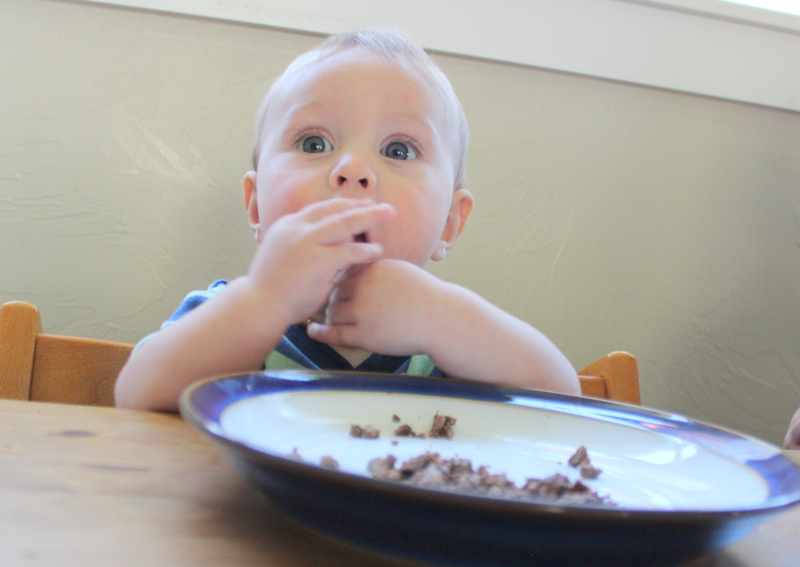 My third child showed a huge interest in solids early, and he was on the small side so I started chicken liver (cooked and salted) with him at 5 months, which he continued to eat quite a bit of until 12-14 months when he started eating more of whatever everyone else was eating. . When introducing first foods, I offered a bite off my plate, as baby usually sat with me at meal time anyway. For lots of family and baby-friendly recipes, I recommend Raising Generation Nourished’s Nourished Beginnings Baby Food book. These recipes are delicious as side dishes for the whole family, and support healthy growth in your little one. Both of my older children had no interest in swallowing solids until about a year. I would offer a couple times a week (it’s messy! I’m lazy and don’t want to clean mashed squash from the ears of a baby who isn’t actually eating anything!) and see when they started swallowing food. We avoid grains for the babies, and for our whole family really as much as possible as other foods are much more nutrient-dense. My second child started solids just as we were starting GAPS (his first birthday ‘cake’ was whipped butternut squash with some salt and a candle!) so he was primarily grain free until he was a preschooler and we went off the GAPS diet. I breastfed my babies on demand; my daughter nursed all.the.time. and my son often went 4-5 hours between feedings from birth. 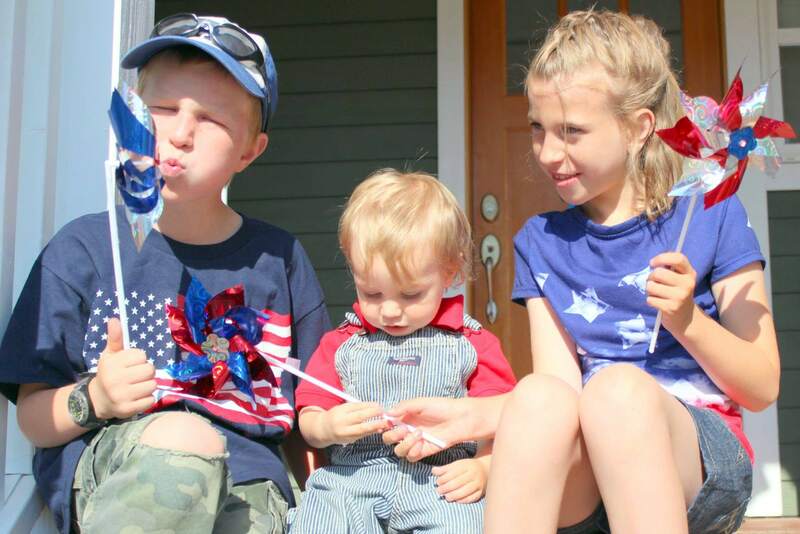 My children were totally different sizes; my first being about 6.5 lbs at birth, and my second 11 lbs (yes, 11), and then my third was a nice easy 8.5 pounds. Different babies are different, that’s why it’s so important to research things like feeding, but then watch your individual baby and do what is working for them. On my children’s totally different feeding schedules they both grew, and both were happy, so it worked. Once solids were introduced, I watched for reactions and then pretty much just fed my young toddlers table food. Nursing continues in our family until at least 2 years, but after a year I start nursing less on demand and scheduling breastfeeding sessions more. If your baby is still hungry and is breastfed, look up block feeding to encourage them to get the fatty hind milk out. Salt their food! Use real salt to taste. Babies need salt. Hold off on sweet foods like cooked fruit until baby is eating proteins and veggies. Smile, nod, and do what you were previously doing when given well meaning advice about feeding your child. Watch your baby like a hawk when you think someone might slip them some unauthorized food. Don’t be afraid of offending them, nobody needs to be giving your infant a lick of a lolly pop or bite of ice cream and it’s your job as a parent to protect them. Don’t stress if your baby is ready for solids early, some babies are. Trust their bodies. Introducing solids as late as possible isn’t the goal any more than introducing them as early as possible. Introduce fish, cod liver oil, egg yolks, and liver early, most babies like these. Tea tree oil topically relieved mastitis for me. Fenugreek tea boosted my supply, but I also think it made my milk more sugary, make sure baby is getting enough hind milk. To support children’s nutrition, combat picky eating, provide time and empty space for engaging play, and yes, to keep my sanity from only having to prepare food 3 times a day, I offer food 3 times a day only (no snacks) for my children and they thrive on this way of eating. For more about that, you can read here. To transition, I use the natural weaning process. For those who use bottles, you can modify this but keep the same spirit, as you wish. Newborns: Nurse on demand. I am not shy about nursing my babies, and since we are an active family, nearly any down time (the line at the grocery store, in the lobby of the school waiting for older kids to get out of school, at the bank as I’m filling out paperwork, by the river as the older kids play or I throw a ball for the dog…) is a good time for me to feed a hungry baby. As baby shows interest in food, allow them to eat off your plate at meal time. Up until (and possibly even a bit past for some babies) 12 months, the majority of their nutrition comes from breastmilk. Only offer food at parents’ meal times- 3 meals a day. This is when you will be transitioning baby to eating. As baby turns 12-14 months and is taking more calories from food, I stop nursing in public. This starts the ‘parent-led feeding’ transition. Baby also is not offered ‘snacks’ during this time, but rather starts to go an hour or more between when nursing is offered. This gently stretches their ability to go without food. I continue to nurse as needed at night, in the morning after waking up, before and after naps as needed, and I nurse baby to sleep. Night wean (still nursing baby to sleep as desired) when you and baby are ready. I have a child who naturally night weaned around 6 months, and another two that I had to transition this process a little after a year. This is up to the parent-child combination and I don’t think there is a hard and fast rule of when this will happen. Cut down to only nursing before sleeps. Mornings can be filled with snuggles and distractions (letting the toddler help make breakfast is a popular distraction here). Finally, wean, (I do this between 2-1/2 and 3, I personally have no problem breastfeeding longer but didn’t find it necessary for my kids) and by now baby is used to going hours between feedings and can go to three meals a day. Sally Fallon talks about traditional cultures supplementing breastmilk at 4 months. She stresses prenatal and pre-conception nutrition, especially with a focus on animal fats, shellfish, and organ meats. She warns about a mother with a low quality diet producing low quality milk; while I don’t disagree with this, I do think that human milk in nearly all situations will be better for a baby than non-human milk. Breastfeeding is recommended to continue to 6 months to a year (I believe a minimum of 2 should be standard). One egg yolk a day with a small amount of grassfed liver and some sea salt is recommended to start at 4 months. Natasha Campbell-McBride has a chapter in Gut and Psychology Syndrome (page 351) that explains her views on feeding a baby in a GAPS family. Because these babies are more likely to have poor gut flora and be nutritionally depleted due to poor health in their parents, special considerations are taken. Breastfeeding is, of course, encouraged, and if that is not possible a wet nurse or milk donor is encouraged (I love this- human milk for human babies should be normal). If for some reason baby must take formula, probiotics should be added to the bottle from the start (Nourishing Traditions has this in their handmade formula as well). As with the entire Gut and Psychology Syndrome protocol, emphasis is placed on reducing toxins as well as eating wholesome foods. Natural crib mattresses should be used, and commercial baby care products with toxic ingredients should be avoided. Homemade meat or fish stock, no salt, start with 1-2 teaspoons starting at 6 months for a breastfed baby. 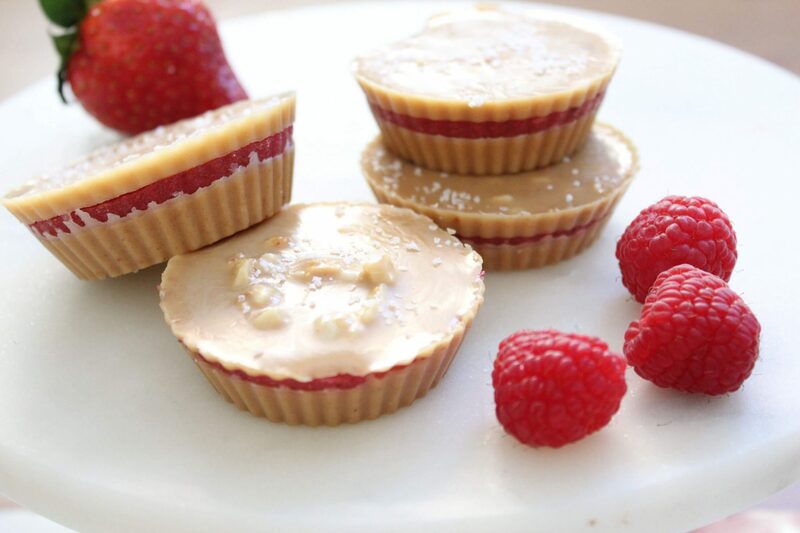 How did you prepare the liver for your little one? Could you elaborate on that a bit? 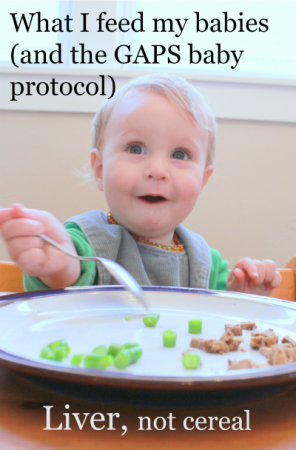 Did you ever do the post on preparing liver to feed to baby? Thanks!